PowerBank 12K3 : 12,000mAh rechargeable Li-ION Power Bank with 3 outputs: USB2.0 for phones; USB2.0 for Tablets; microUSB for phones & Tablets. Includes USB2.0-to-microUSB cable, AND includes Adapter: microUSB to 8-Pin lightning connector (for iPhones & iPads). 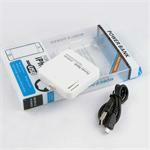 Charges all major brands of phones & tablets (Apple, Samsung, LG, Morotola, Kindle, HTC,etc). Re-charges with the supplied USB cable - plug into computer to re-charge, OR plug into 5VDC USB output (wall adapter - not included) to charge. 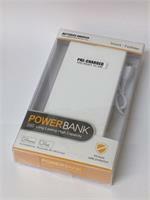 The PowerBank 12K3 arrives to you PRE-CHARGED & READY TO USE ! Has LED power indicator bars on side. Also has built-in LED flashlight. 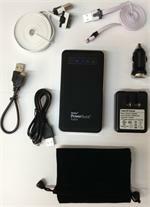 EPK-18000: Multi-Function PowerBank-Jump-starter. 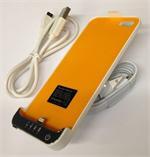 NEW 18,000mAh capacity!